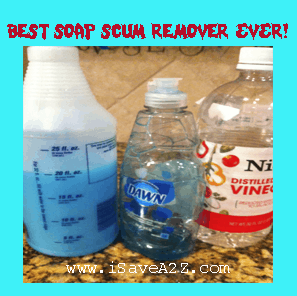 Best Homemade Soap Scum Remover EVER!!! Only 2 ingredients! Here’s one of the best homemade soap scum removers that I’ve ever tried. I am so delighted to tell you that I have a recipe that will rid your shower of that horrible soap scum with very little work on your part! Use it sparingly. You don’t need to use much of it. If you use too much you will end up with a shower full of bubbles. A little bit goes a long way so it’s budget friendly too! You will use a 1:1 ratio when making this recipe. Example: Mix one cup of Blue Dawn and one cup of distilled vinegar. First, heat your vinegar until it’s boiling. (I used two cups and it took less than 2 minutes) Next, pour both ingredients in the spray bottle and get to work! The heating method will allow both ingredients to mix well and you don’t have to reheat it to use it only to mix it. The best part about this recipe is that this mixture comes out a bit thick and actually stays in place when you spray it on your shower doors. I love that! Use: Leave this one those soap scum stains for about 2 hours and overnight for those really tough stains then wipe away with a sponge. It’s that easy! I’ve tried MANY recipes with no much success so I am very excited to share this one with you! By Jennifer on July 4, 2012 Frugal Living. I tried it. It works! I can not wait to try this out. My LO is going to be moving from his baby bathtub to the “big boy” tub and I want to make sure I can keep all the grime from my husband and older son working on vehicles and taking a shower from getting on him.